Four items belong to the Home menu. An additional entry ‘Report’ is available in the Professional and Enterprise versions. 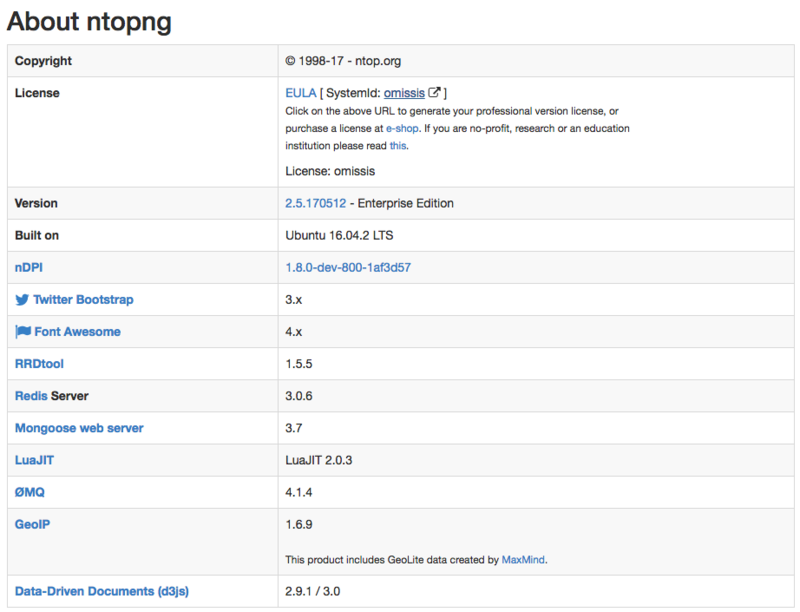 Shows information about ntopng Version, Platform, Currently Logged User, Uptime value and some details related to its internals. The upgrade from Community to Professional Version can be done by clicking on the system ID. The browser will be redirected to the ntop shop to generate a valid license. The generated id should be save in the appropriate field in License field. Is a link to http://www.ntop.org/blog/ page where some useful information of tricks can be found. Is a link to https://github.com/ntop/ntopng/issues page where you can report specific bug you discovered. Provides a shortcut to default dashboard page of ntopng. The dashboard is discussed in greater detail in the following section.